Perhaps you are experiencing something wonderful or watching a nice movie and you desperately want to share the joyful find with your buddies in Facebook. Of course you can always log in to Facebook and update your profile status accordingly. However, one of the fastest and most effective ways to do so is via SMS. Facebook has made life easier especially for users who always travel and have no time to access their accounts with a few new useful features. One of these features is to allow users to update their status via a short text message sent out via their mobile phone. Users who want to take advantage of this facility can always log in to Facebook and register their mobile phone to the Facebook account. 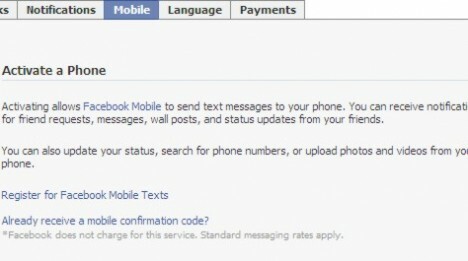 Once the phone is registered and activated, users can then update their Facebook status via SMS. Of course the mobile phone feature more than just allow users to update their status via SMS. Users can also receive notification for friend requests, messages, wall posts, and status updates from friends, search for phone numbers, upload photos/videos, etc. To activate a mobile phone, users need to sign in to Facebook. Go to Settings and click “Account Settings”. Click on to the “Mobile” tab. Click the “Register for Facebook Mobile Texts”. On the “Activate Facebook Texts” box prompted, fill in the information accordingly. Users will thence receive a confirmation code via their mobile phone. Enter the confirmation code will activate the mobile account officially. Via SMS service, users will enjoy another option and do not necessary need to rely on their laptop or computer to update their Facebook status anymore. The setback of this service is it does not support all countries but is limited to certain countries and certain mobile service providers only.